On August 1, almost the entire Earth-facing side of the sun erupted in a tumult of activity. There was a C3-class solar flare, a solar tsunami, multiple filaments of magnetism lifting off the stellar surface, large-scale shaking of the solar corona, radio bursts, a coronal mass ejection and more. This extreme ultraviolet snapshot from the Solar Dynamics Observatory (SDO) shows the sun's northern hemisphere in mid-eruption. Different colors in the image represent different gas temperatures. One of the fastest big solar eruptions in years has beenobserved streaking away from the sun at more than 2.2 million mph by two NASAspacecraft. The materialejected from the sun was seen speeding toward Earth at more than 1,000kilometers per second, or just over 2.2 million mph (3.6 million kph). 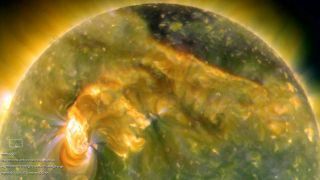 Anotherwave from the event was expected to hit Earth's magnetic field on Wednesday.NASA's two STEREO spacecraft, which monitor the sun's weather in 3-D, alsorecorded a videoof the sun eruption. "These kinds of eruptions are one of the first signsthat the sun is waking up and heading toward another solar maximum expected inthe 2013 time frame," NASA officials said in a statement. The sun goesthrough a regular 11-year activity cycle. The last solar maximum occurred in2001 and its recent extreme solar minimum was particularly weak andlong-lasting, the space agency added. Coronal mass ejections are eruptions of charged particlesfrom the sun that stream out over several hours. They can contain severalbillion tons of plasma and expand away from the sun at speeds of up to 1million mph (1.6 million kph). At such speeds, they can cross the 93million-mile (150 million-km) gulf between the Earth and sun in two to fourdays. The material belched from the sun during the Aug. 1 flareis not expected to cause any disturbances on Earth other than creatingspectacular auroras. Auroras are created when charged particles are caught byEarth's magnetic field and interact with the atmosphere above the poles. The Aug. 1 solar flare was a moderate C-class flare. Thecoronal mass ejection it set off created a strong so-called geomagnetic stormthat lasted nearly 12 hours ? enough time for auroras to spread from Europe toNorth America, NASA officials said in a statement. Stronger solar storms could cause adverse impacts tospace-based assets and technological infrastructure on Earth.